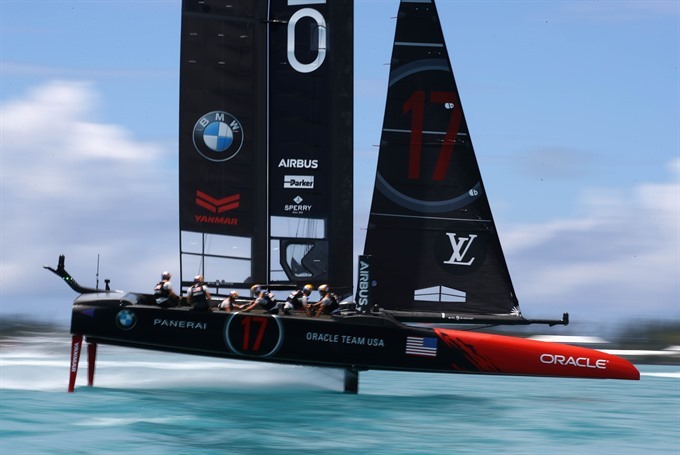 HAMILTON - Oracle Team USA skipper Jimmy Spithill admits his passion for the America’s Cup amounts to obsession, and a crushing 7-1 loss to New Zealand on Monday doesn’t change that. "I love this game. I probably shouldn’t say this but I think about the America’s Cup more than my own family," the pugnacious Australian said after New Zealand completed their dominant victory on Bermuda’s Great Sound. The underdog Kiwis, beaten twice by the USA in round-robin qualifying, were undeniably the better team by the time the final first-to-seven series rolled around. They erased a minus-one deficit with their first win of the final, and sprinted to a 4-0 lead in the series before Spithill scraped out a win. Frantic modifications to the USA boat in a bid to find the speed to challenge the Kiwis weren’t enough. Spithill, who steered Oracle to victories in 2010 and 2013, admitted as much. "We’re disappointed right now, but full credit to Team New Zealand," he said. "Man, what a series ... they really made fewer mistakes and they fully deserve it." Spithill said the New Zealand team’s build-up to the Cup, which included spending more time back home before joining the other challengers already gathering to test and train in Bermuda, had kept their rivals guessing. "They were down there training on their own and you’ve really got to give credit to them for the incredible job they’ve done," he said. Spithill wasn’t ready to contemplate his America’s Cup future, and whether he’d remain with the Oracle outfit backed by billionaire Larry Ellison. "I’m not sure, I’ve just spent so much time and energy on really just one day at a time," Spithill said. "I’ve really just got to thank the entire team and then just take it from there.